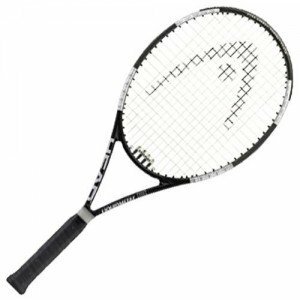 The Head Liquidmetal 8 is the racket that we recommend for beginners. This racket falls into the category of a power (game improvement) racket. However, this racket also provides solid control. It is light and easy to maneuver. The Liquidmetal 8 is best suited for players at the 2.0 – 4.5 level of play. Although this racket falls into the category of a power (game improvement) racket that provides power for beginners who do not provide adequate power through their strokes, this racket does not provide excessive power. Instead it provides quite good control. This means that a beginner can continue to use this racket for some time as he/she improves and generates more power from his/her strokes as the racket will provide the control needed for the added power. This racket is comparatively very light and close to even balanced. These qualities make this racket very easy to maneuver. Some outcomes of fast maneuverability include the racket being especially helpful for doubles players, players who like to take the ball on the rise and small built players who would find it easier to play with a lighter racket. Note that in general the lighter a racket the less stable it is. This racket provides good stability for a light racket. Even off center hits are quite stable. This is due at least in part to what Head calls the Total Sweet Spot construction where Liquidemetal is placed in the 10, 2, 4 and 8 o’clock racket head positions. This is a very comfortable racket. Only little vibration is transmitted to the arm at impact. The sweet spot is quite large.